In this lesson, we will look at place values for whole numbers and place values for decimal numbers. For more practice in place values, you could go to our Interactive Math Zone where you can generate worksheets according to your needs and get them marked online. Each digit in a whole number has a place value, based on its position from the right, as seen in the following place value chart. Scroll down the page for more examples and solutions. The value of a digit in the number is the digit multiplied by the place value. 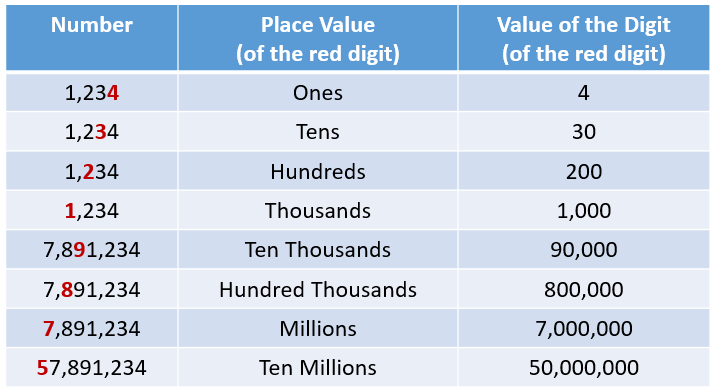 The following table shows examples to distinguish between the place value of a digit and the value of a digit. For decimals, the place value chart will include the decimal point and the positions after the decimal point as illustrated in the following table. Remember that the place value after the decimal point is tenths. How to determine the place value of the digits in a decimal and how to read decimals?